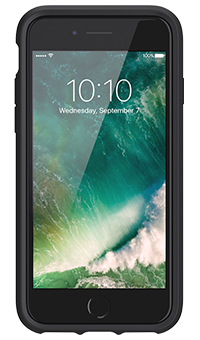 With its slim, yet durable design, the Griffin Survivor Strong case for iPhone 8 or iPhone 7 keeps your phone safe without adding bulk. The Griffin Survivor Strong case for iPhone 8 or iPhone 7 comes with a two-layer shell, protecting your phone from drops of up to 2.1 metres, even on concrete. The Survivor Strong is built to meet or exceed Military Standard 810-G protection standards. The shatter-resistant shell uses Griffin's exclusive Impact Dispersion System to keep your iPhone safe, even if you drop it from 2.1 metres onto concrete. There's strength in that ultra-slim profile. Barely tipping the scale at less than two ounces, the Survivor Strong is light, but delivers heavy-duty protection. On the inside, the Survivor Strong surrounds your phone in a rigid, shatterproof polycarbonate shell. On the outside, a wear-resistant, sure-grip layer makes sure you can hold your phone safely, but still slide it into your pocket smoothly.